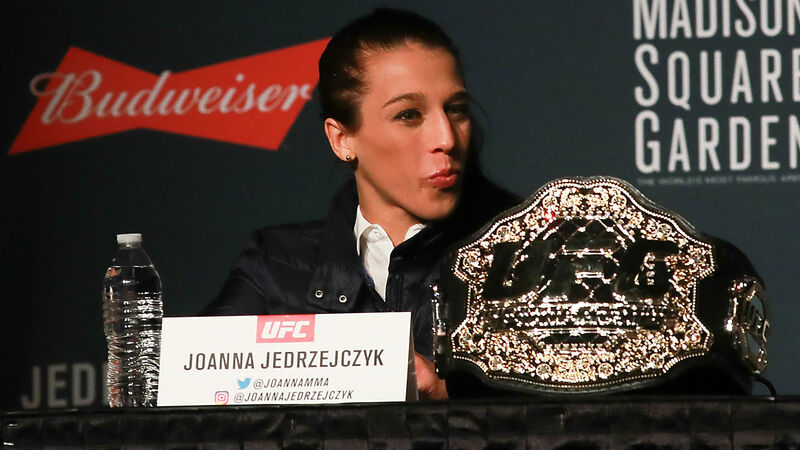 UFC president Dana White announced Thursday on Canadian network TSN that Joanna Jedrzejczyk will take on Valentina Shevchenko for the vacant women’s flyweight championship in the co-main event of UFC 231 on Dec. 8 at Scotiabank Arena in Toronto. Inaugural titleholder Nicco Montano was supposed to face Shevchenko at UFC 228 but was sent to the hospital the day before the show after suffering a kidney issue related to weight cutting. The fight was later canceled and the UFC subsequently stripped Montano of the title because of the incident. White said afterward that Shevchenko would receive an immediate title opportunity. Jedrzejczyk (14-2) will be competing at 125 pounds for the first time in her career. The former strawweight champion recently expressed interest in fighting Shevchenko. She last competed in July, defeating Tecia Torres after suffering back-to-back losses to current champ Rose Namajunas. Shevchenko (15-3) made her 125-pound debut in February, notching a second-round submission of Priscilia Cachoeira. This is the fourth time Jedrzejczyk and Shevchenko have locked horns but the first in mixed martial arts. Shevchenko defeated Jedrzejczyk three times in kickboxing matches, with all of the victories coming by decision. The main event of UFC 231 is Max Holloway defending his featherweight title against Brian Ortega.